Winning in today's light production marketplace requires the ability to grow revenue and improve profitability. Success demands standout performance, stellar productivity, and absolute versatility. With a dramatically new platform, the imageRUNNER ADVANCE C9065 PRO model is designed to satisfy the specific needs of corporate in-house print facilities, commercial on-demand print centers, and design agencies, providing outstanding value in every way. The imageRUNNER ADVANCE C9065 PRO model delivers output speeds of up to 65 ppm in black-and-white and 65 ppm in color, and single pass duplex scanning at speeds of up to 200 ipm (duplex, 300dpi, black-and-white). Enjoy standard Universal Send, standard UFR II printing with flexible print options, and an extensive range of paper handling and finishing options. With its brilliant image quality, exceptional productivity, flexible versatility, and streamlined workflow capabilities, the imageRUNNER ADVANCE C9065 PRO promises a brilliant future for digital color print production. Large upright "Tilt and Swivel" control panel that provides easy viewing and allows users to adjust the UI to a comfortable position. True 1200 x 1200 dpi print resolution produces crisp text with smooth corners, while subtle gradient transitions give images remarkable clarity. Precise eight-beam red lasers have a small diameter to produce high quality images with proper shading and accurate registration, without sacrificing productivity. Documents are output at an amazing speed of up to 65 ppm (B/W, Color) for exceptional productivity. 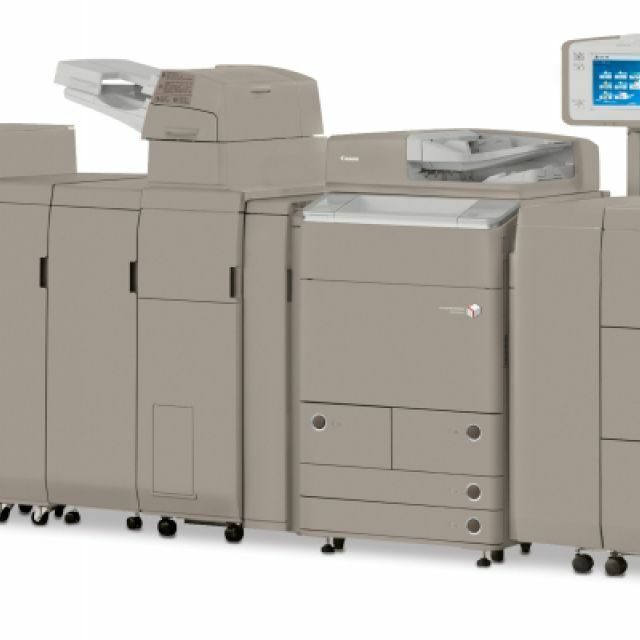 Rapidly convert paper documents to digital files with the 300-sheet capacity, ultra-fast single-pass duplex document feeder at speeds of up to 200 ipm (duplex, black-and-white, 300 dpi). A number of features have been implemented to streamline steps, helping to compost and manage print jobs and generate ouptut more rapidly. High toner and drum yields, remote notification of low supply inventory, and the ability to replace toner on the fly help minimize downtime and maximize productivity.